Congratulations Danielle!! You are the winner of a $40 GC to Something About Silver!! All you have to do now is reply to the email I am about to send within 48 hours with your full name and mailing address (include your email address). I am not sure if they are going to send a code for you to use or have you pick something which they will then send you! I have friends in the jewelry business so I don’t often order any over the internet. When Something About Silver contacted me about doing a review/giveaway for their site for some reason I actually went in to have a look around. I loved what I saw!! I immediately replied saying I would love to review the site and pick out a piece just for me. They have everything silver from baby spoons and earrings to Easter items to gifts for men and even ready made pieces. I do not doubt if you need a special gift you will find it here! It just came today!! When I took it out, Baby, my cat, immediately tried to take it from me—hey it was dangling from my fingers and oh so shiny!! I have hidden it from her!! She really wanted that necklace!! I am terrible with taking pictures but the folks at Something about Silver said I could use the pictures on their site. Below is the necklace I choose with the same chain in a 20” length. 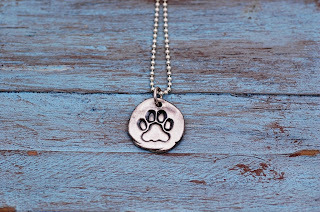 It is called the Rustic Paw Print Necklace. If you have ever been to my facebook page you KNOW I love animals!! If I wasn’t going to keep this one it would make a perfect gift to send direct to someone special! It came in a beige box with the prettiest blue bow. Inside the necklace was enclosed in a plastic zip lock which was enclosed in a cloth drawstring bag. Directions for care were enclosed as well as a small polishing cloth. Something About Silver would like to offer a giveaway to my readers for a $40 dollar gift-card for one winner, the giveaway is open to the U.S. and Canada. I was not paid cash for this post. I was sent a silver necklace for review purposes. All opinions expressed are my own honest opinions. For more information please check my Disclosure Statement. Our giveaways are in no way sponsored or promoted by Facebook. How lovely to review something nice and that appeals to you. 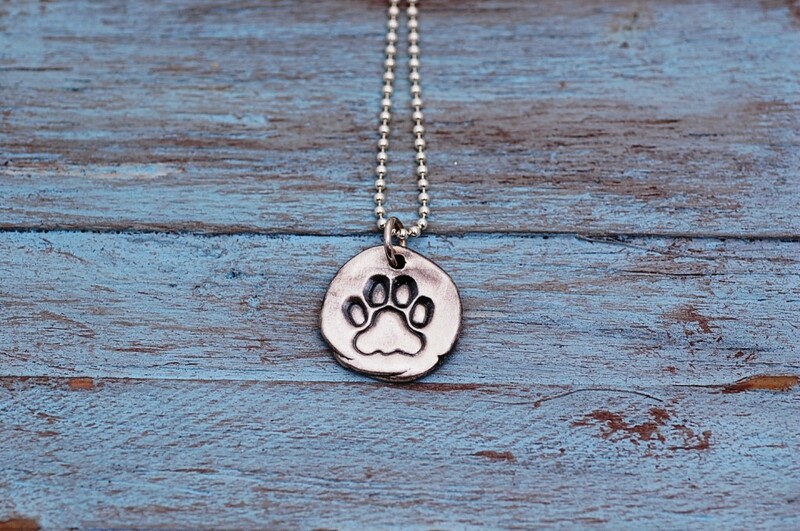 The necklace is beautiful and no wonder your kitty wanted it. Paws and all. I would like to get Mom's Little Necklace with charms for all six of my children. i would get the initial leaf necklace! so beautiful! i follow something about silver as courtney hennagir. i follow you on twitter as @chennagir. i follow something about silver on twitter as @chennagir. I may choose the Xoxo necklace. I love the stacking rings. 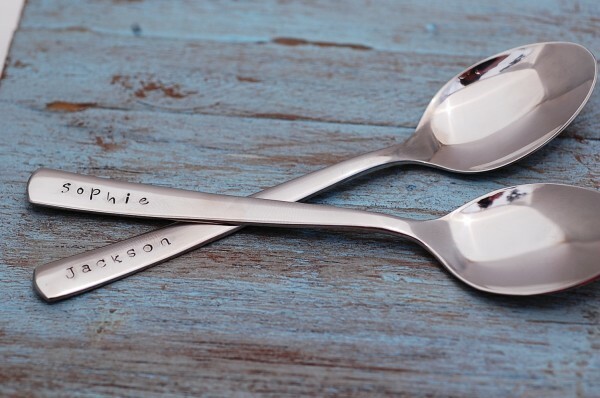 Oh I would love the baby spoons! I love how they are engraved!!! I would pick the Dad Keychain! I would either get two silver spoons (perfect for two friends who are both expecting their little ones), or the Little Gem Drops Earrings! I love those topaz drop earrings! I would choose the hand stamped stacking rings in sterling silver with my three childrens names on them. So very cool! I think the little girl heart necklace is so pretty! This is precious. 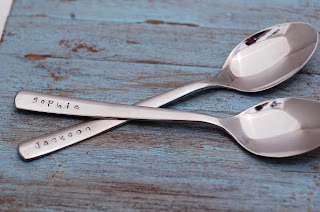 I would like to have the Vintage Hand Stamped Wedding Cake Forks. Already a GFC follower. Liked you and SaS in Facebook. I prefer silver over gold. I love the necklace it is really cute. I would like a baby spoon too. Lovely product for a silver material.